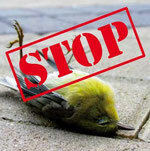 We take the protection of bird life is a major concern. We use the latest technology to wind turbines, scheduled monuments, glass surfaces make to buildings and power transmission lines bird friendly. Advanced analysis systems are able to detect approaching birds as such and in a collision drohendern the wind turbine briefly off and restore power - fully automatically. Many birds collide every year wih window glass, since they cannot see it. Modern glass and bird protecting foil can help. Power lines must be no bird killer. Covers and highly visible Birds markings help. Field research with radar helps to understand the local bird migration and how large-scale building projects must be shaped to minimize bird risks.